In a new IMAX film currently being shown at the Maryland Science Center, the U.S. Brig Niagara plays the role of a British warship, and Lake Erie stands in for the Chesapeake Bay. (WBAL in Baltimore has footage.) Branching out from its type-casting as the victorious American ship of the Battle of Lake Erie (Sept. 1813), Niagara takes a star turn (among a fleet of computer-generated ships) during the 1814 British attack on Baltimore’s Fort McHenry that led Francis Scott Key to write the words to what became the U.S. national anthem in 1931. [Whoa, that’s a really long sentence, sorry] “Star-Spangled Banner Anthem of Liberty” is the science center’s first history-themed IMAX film; it will remain on view through the fall. It's a busy summer at Old Economy Village. In addition to a new exhibit on Harmonist clothing (now through August 10), work continues on the restoration of the George and Frederick Rapp Houses. The long-awaited reproduction wallpaper is being installed and it won’t be long before furnishings can be returned to their proper places. To keep up with the progress, check out curator Sarah Buffington’s blog. The folks at Daniel Boone Homestead shared photos of their recent Evening on the Green. Looks like a lovely way to spend a summer night. 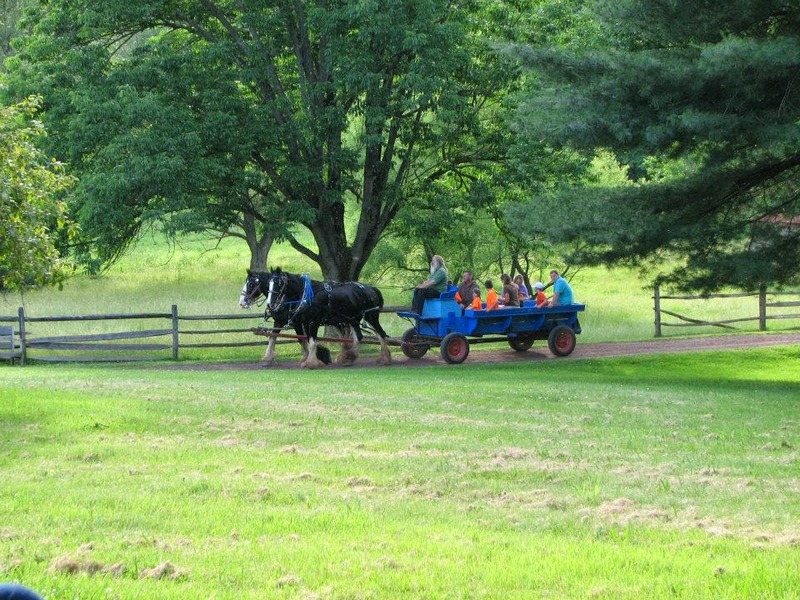 In the spirit of Trails of History cooperation, the wagon, horses and driver made the trip over from Landis Valley Village and Farm Museum to help out. There’s probably other stuff I’ve missed. 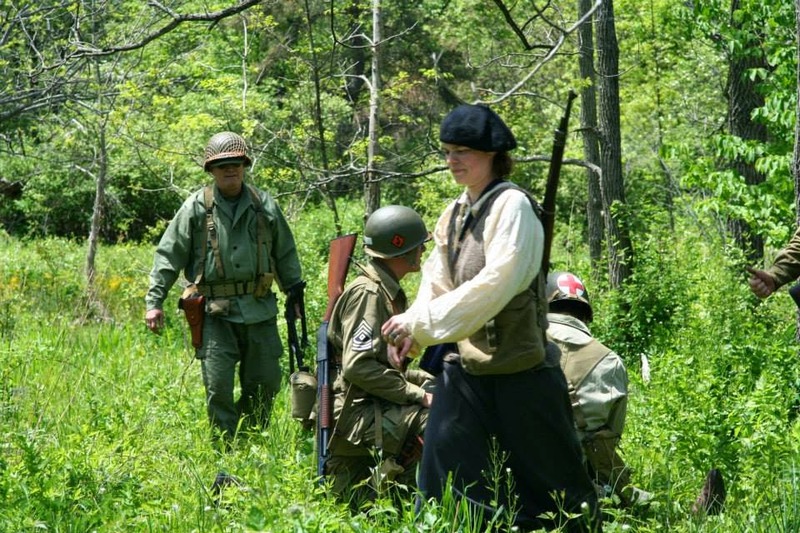 Info for this weekend on the Trails of History was posted late last month and has been updated. Look for the July program preview mid-week next week, in time for Independence Day. Enjoy your weekend. Tomorrow is the official start of summer, although I’d say the 90-degree temps earlier this week qualify as well. 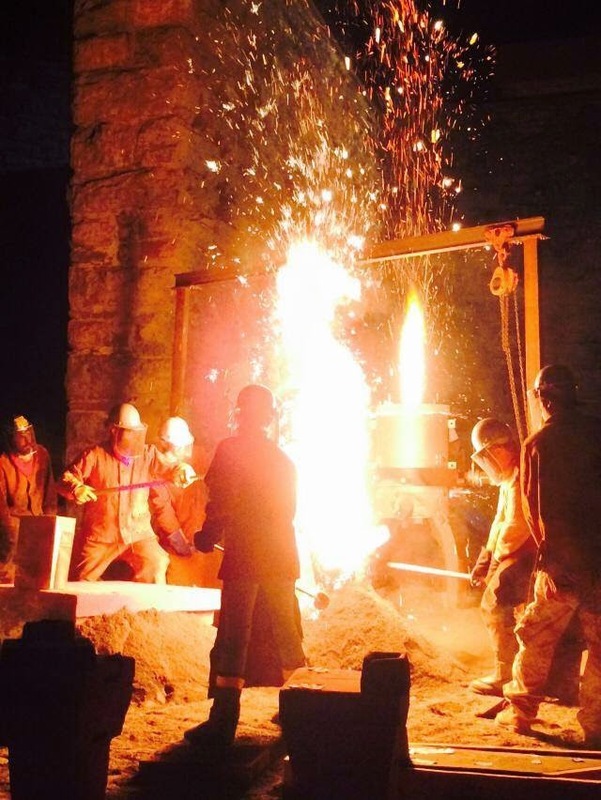 The list of June events was posted a few weeks ago, but please note that there have been some additions and updates (worth another look if you’re headed to the Trails of History this weekend). I should have shared this before (or maybe I did and I forgot). To find all of PHMC’s Facebook posts in one spot, be sure to follow the Pennsylvania Trails of History interest page (in addition to the regular PATOH FB page). I attended Pennsbury Manor’s “Brews and Bites” event Saturday (they shared photos on Facebook). It was a beautiful evening along the Delaware River with excellent food, great beer from a variety of brewers, and an amazing selection of (definitely not 17th-century) music. 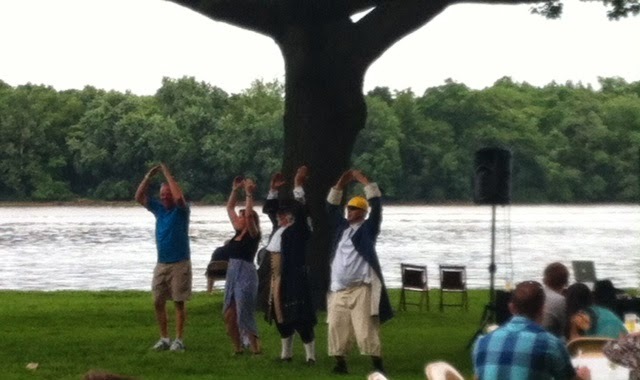 Once you’ve watched “William Penn” and friends dancing to “YMCA,” you know it’s a party. Next year, get your tickets early; I predict that word-of-mouth will make them sell quickly. For Father’s Day, Ephrata Cloister offered hands-on activities related to apprenticeship, carpentry, papermaking, and printing. The following day, a lovely article in the Lancaster Intelligencer Journal/New Era featured a family who attended as a way to celebrate and spend time together doing something meaningful and fun. Their comments should warm the heart of anyone who works with historic sites or museums and anyone who has fond memories of museum visits with family or friends. Those of you who, like me, fall into both categories might want to grab a tissue. With support from the American Chemical Society, the Friends of Joseph Priestley House have produced a new video about Dr. Priestley's discovery of carbon monoxide (this particular discovery took place in the laboratory attached to his home in Northumberland - part of the PA Trails of History). The video illustrates the scientific work of Priestley and his contemporaries. We then see Dr. Dee Casteel perform an experiment to isolate carbon monoxide using modern laboratory equipment and safeguards. The video finishes up by highlighting the dangers of carbon monoxide, its industrial use, and ways to make your home safer. At 11 minutes, the video is too long for me to embed, but I encourage you to watch it on the Joseph Priestley House website and respond to the short survey they've included to provide feedback for future efforts. AAA New York’s website features a nice article by Robert Sinclair about his visit to the Railroad Museum of Pennsylvania. He includes photos from his visit, including the current exhibit on railroad dining cars. GoErie.com has photos of the fireworks display at the Erie Maritime Museum and US Brig Niagara Mariner’s Ball a couple of weeks ago. A nice way to warm up for Independence Day. Yes, it’s Friday the 13th. You can embrace it, as the folks in Erie did. Or you can worry about it. Or you can treat it like any other Friday in a string of rainy, humid summer days and look forward to a nicer weekend. Since I have tickets to attend Pennsbury Manor’s Brews & Bites tomorrow, I’ll go with door number 3. If you’re looking for something to do this weekend, check out the Trails of History program listings. The annual Fire at the Furnace and Arts on Fire Festival at Scranton Iron Furnaces were well-attended and, as always, extremely photogenic. Learn more on the Anthracite Heritage Museum’s Facebook page. 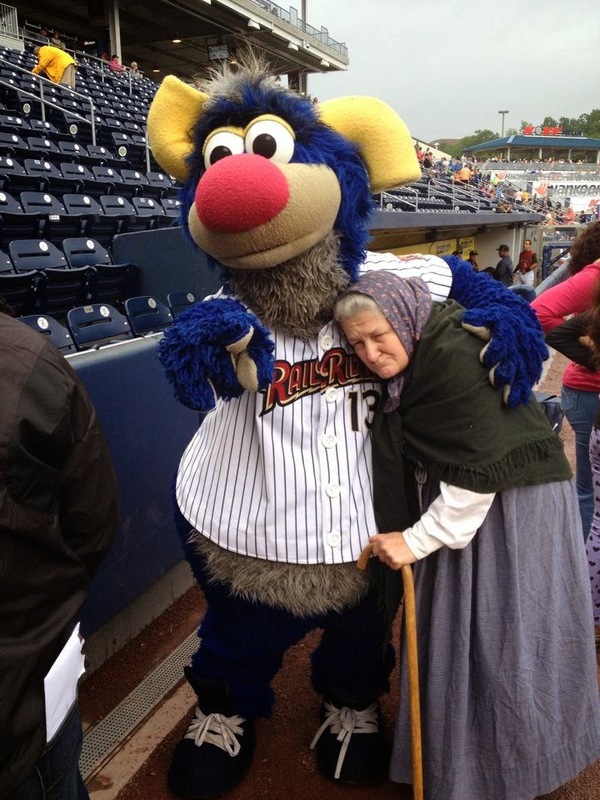 Staff and volunteers from Eckley Miners’ Village were at the Scranton/Wilkes-Barre RailRiders game earlier this week to promote the site and enjoy some minor league baseball. Eckley Players member Regina “Baba” Drasher threw out one of the night’s ceremonial first pitches. 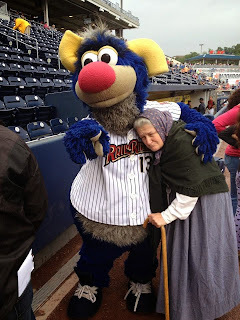 In the picture above, Baba makes a new friend--Champ, one of the RailRiders' mascots (seems like minor league teams usually have more than one). The historic Ephrata Cloister is once again sharing the work of their summer interns on their blog, Chronicle Ephrata. You can find the blog here or by following Ephrata on Facebook. If you are planning to attend Old Economy Village’s event on July 12, “An American Celebration,” and you have kids who have completed grades 3, 4, 5, or 6, it’s time for them to start studying. The winner of a good old-fashioned spelling bee will take home a $100 prize. Download the word list and start the nightly quizzes! Just thought I'd pass along a few items here as we approach mid-week (and in case I don't manage a post for Friday). 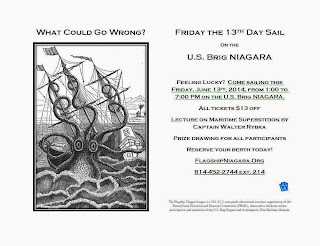 Making a virtue of necessity, the Flagship Niagara has embraced the fact that their next day sail opportunity falls on Friday the 13th. They've posted some fun stuff on Facebook about maritime superstitions and are discounting the price of Friday's experience by $13. 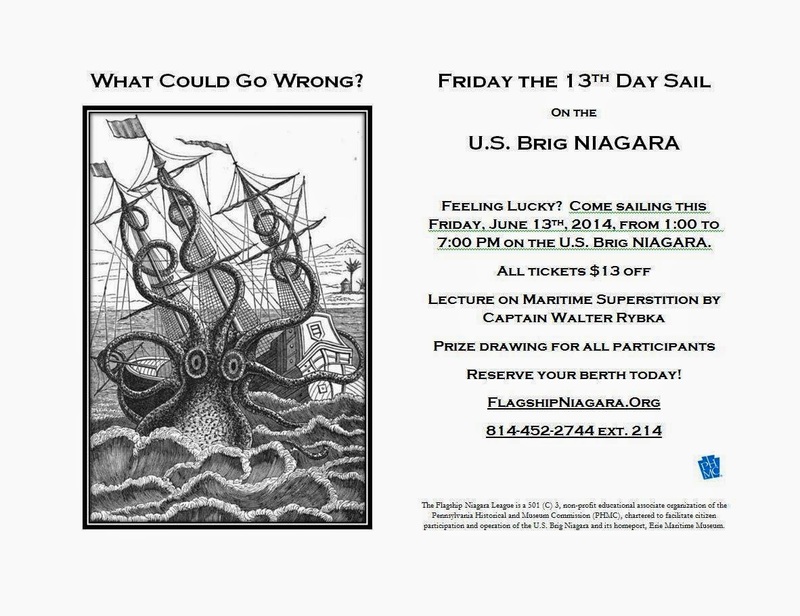 Sailors are a superstitious lot, and senior captain Walter Rybka will be on board to share stories. Check the website to see if space is still available and to purchase tickets. If you just can't risk it but still want to know what it's like to be on board Niagara, you can listen to Aubrey Ralph's radio piece for Public Radio Exchange (PRX) about her 9-day sojourn last summer. Last week's Trailheads post has a listing of events for June (please note that there are a few updates). We’re headed into the busiest season of the year, so you’ll find loads of options for exploring Pennsylvania’s rich history and enjoying the summer weather. You know how I love to see connections between sites, so here’s something that made me happy (and I didn’t exactly have to dig deep to find the links). The Young Center for Anabaptist and Pietist Studies (Elizabethtown College) conference this weekend on the history and nature of prophecy among various religious groups in early America features both of the religious history sites on the Trails of History. This evening (June 6), fresh from a speaking engagement at Old Economy Village on Wednesday, Dr. Alice Ott will present her work on Harmony Society founder George Rapp, his religious beliefs, and his own and others’ perceptions of him as a prophet. Ott was a PHMC Scholar in Residence at OEV in 2006. Tomorrow, Ephrata Cloister museum educator Michael Showalter will share a piece of his considerable research on the site’s history in a talk entitled “Three Wives, Two Ghosts, One Mystic: A Footnote in the Ephrata Story.” He will be presenting alongside Dr. Jeff Bach, director of the Young Center, who has researched and written extensively about the community at Ephrata (now that I think of it, some of that work was conducted when Bach was a PHMC Scholar in Residence). Today is the 70th anniversary of the landing of 160,000 Allied troops on the beaches of Normandy, France. The invasion, known as D-Day, was part of a larger plan to defeat Nazi Germany and release its hold on Europe. 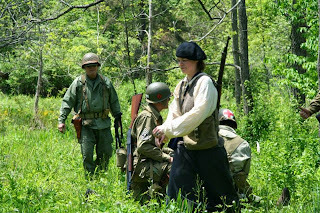 In honor of this occasion, you might like to see photos from the “World War II Revisited” program at the Pennsylvania Military Museum on Memorial Day weekend.